Looks like this is back up on eBay again. Seller has a different name but seems to be using the same pictures, so I assume it's whoever bought it last. Always tempting though... https://rover.ebay.com/rover/0/0/0?mpre=https%3A%2F%2Fwww.ebay.co.uk%2Fulk%2Fitm%2F192866844207 Edit: new seller seems to be trade, judging by their other items being cars too. Hi, where's the car located? DanDannyDanDan replied to DanDannyDanDan's topic in New member? Fair enough, I assumed all the GM parts would make it American. I do like the styling of them though, small car with big arches is always a good thing in my books. Haha, fortunately nothing that bad. Just a wee Corsa. Not sure what country of origin they claim to be though...? That's the dream. 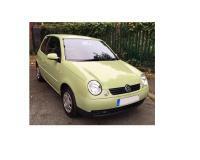 Currently running a tdi at the moment, but nothing as stylish as a Lupo. DanDannyDanDan posted a topic in New member? Hi All, I just registered, I've been popping in and out from time to time over the past few months so figured I should register and say hi. My name's Danny and I live near Manchester (Glossop, but people seem to not know where that is). I frikkin' love Lupos, I've been after one for years and recently bought one for my girlfriend for her first car, a lovely low mileage, green, 1.4 s auto and it's just made me want (at least) one for myself now too. Hoping to do a few subtle improvements on her Lupo, mostly just to tidy it up, mainly just debadge and maybe lower too...? I'm considering getting a GTI for myself, or/and maybe a cheap diesel or 3L for an everyday runner (that £200 one that just went was ripe for it, sad I just missed that one) to avoid racking up the miles on a good one (90 miles or so daily commute quickly adds up).